I had just run past the homeless man who stood in the middle of the double tracked, smooth, white, concrete bike trail that we had been following for 20 miles. We were blasting through his space; no race officials had asked him if we could disturb his mid-morning slumber, all 1,500 of us running the marathon that day. He was tall and bearded, with liver-failure tan skin and he giggled defiantly as he stood in the middle of the course while we ran around him. 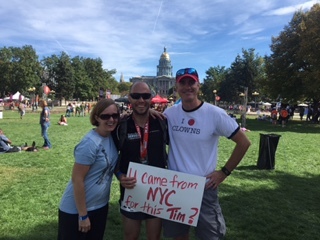 He laughed at us in our funny runny clothes and chatted with the uninspired “official race photographer” sitting in a lawn chair under a yellow umbrella working for commission as he snapped shots of us, our faces and race numbers, meandering towards downtown Denver. The man turned as I ran by and took a few steps after me calling out to me like I was his friend. I kept going, we all kept going right by. Less than half a mile later I ran by a person in the crowd who saw my bare feet and yelled, “you made it this far?” as he handed me a cup of water. Reactions to running barefoot are as much fun as the race itself. Many people just stare for a beat or two and mumble, “wow.” Others cheer more robustly, small children often laugh and think its silly. One lady in Central Park a week before the race, when I was on a training run, yelled at me, scolding me that “that is NOT good for you.” This man, though seemed completely amazed. I am amazed that on the same day that I ran 26.2 miles in Denver, 8,000 Syrians moved through Greece having escaped systematic slaughter in Syria to face abhorrent discrimination and xenophobia in Turkey so much that they fled through Greece to reach other member countries of the European Union—8,000 people in one day. Thousands of people daily have walked, run and swam to seek safety. Many left all their possessions, many left pets behind, and many lost their few remaining clothes in the ocean. Too many have lost their sons and daughters to the sea. The rest of the race I thought about how far so many Syrians have made it, the half a million who have survived and escaped the senseless war in their country. When people asked me about why I was not wearing shoes I told them about the work of Clowns Without Borders and how I was raising money to help provide psychosocial support to Syrian children and families at this time of crisis who had lost everything. Marathons are great places to meet people and chat, chatting while running at altitude for a person who lives at sea level is a bit more challenging, but it wasn’t as hard as I thought. What was most challenging, though, was the reaction I got from a nurse at the end of the race. I finished the run in about 3 hours and 30 minutes and my feet ached. I limped to the medical tent and asked for some ice to place on the tops of my feet. The woman I met at the tent was a nurse who had flown from Boston to provide medical support for the runners. She asked about the barefoot thing and I told her the same elevator speech I had been telling people during the run, this time my voice quivered and failed. Emotions and hypoglycemia made me choke on my words and stir salty tears. She patiently allowed me to finish my thoughts and instead of the normal, “Good for you” that I got from most other people that I had told about this fund raising effort, she paused with moist eyes. She wrapped Saran Wrap around the ice bags on my feet and helped me to standing. She was right, in too many ways it seems that the world has forgotten. In the same way that we ran past the homeless man who awoke that morning to more than 1,000 runners stampeding through the place he called home—the world continues to run on. The efforts of Clowns Without Borders in support of Syrian refugees are relatively small. It is overwhelming at times to fathom the suffering occurring in the Aegean Islands and surrounding countries; it is overwhelming to imagine how we can help. But there are ways to help and thousands of people are engaging in this movement to support refugees. I ask that you not forget and keep running. Allow the 24-hour news cycle to run by, the avalanche of social media, and remember what is happening in Syria and the surrounding countries. Hang on to that. Seek ways to support, whether it is by donating to organizations helping or whether it is simply keeping the refugee crisis in your conversations with friends and families.